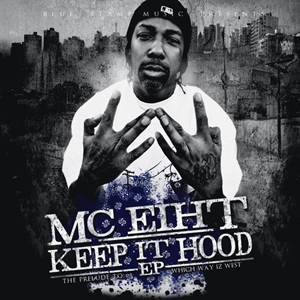 MC Eiht drops the new single “Blue Stamp” for his recently released EP titled “Keep It Hood“. MC Eiht has always been consistent in his music and this new single is no different. Matter of fact, after buying the EP it is safe to say that about “Keep It Hood” overall. MC Eiht‘s latest project has been fully produced by the Austria native and very talented Brenk Sinatra and features scratches from DJ Premier. As it says on the cover, Eiht‘s “Keep It Hood” is a prelude to the highly anticipated album “Which Way Iz West” which will be executive produced by DJ Premier. The presence of Premo is also evident on some of the these tracks as he participates by dropping some scratches and cuts in some of the songs such as “The Reign“. “Keep It Hood” is now available on iTunes.